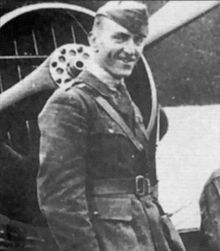 Edward Vernon Rickenbacker (October 8, 1890 – July 23, 1973) was an American fighter ace in World War I and Medal of Honor recipient. With 26 aerial victories, he was America's most successful fighter ace in the war. He was also considered to have received the most awards for valor by an American during the war. He was also a race car driver and automotive designer, a government consultant in military matters and a pioneer in air transportation, particularly as the long-time head of Eastern Air Lines. Edward Rickenbacker was born in Columbus, Ohio, to Swiss German-speaking immigrants. From childhood, he loved machines and experimented with them, encouraged by his father's words: "A machine has to have a purpose". In what was to become one of the defining characteristics of Rickenbacker's life, he nearly died many times in events ranging from an early run-in with a horse-drawn carriage, to a botched tonsillectomy, to airplane crashes. His first life-threatening experience occurred when he was in the "Horsehead Gang". He lived near a mine, and they decided to ride a cart down the slope. It tipped over and almost crushed them. According to Rickenbacker's autobiography, at age thirteen, his schooling ended in grade seven after the accidental death of his father on August 26, 1904. However, according to Eddie Rickenbacker: An American Hero in the Twentieth Century, by W. David Lewis, his father died after an altercation with another man in Columbus. Rickenbacker found jobs to help support the family, but driven by an intense admiration for machines, Rickenbacker taught himself as much as he could, including enrolling in a correspondence course in engineering. He aggressively pursued any chance of involvement with automobiles. Rickenbacker went to work at the Columbus Buggy Company, eventually becoming a salesman, working in both Dallas, Texas, and Tucson, Arizona. Rickenbacker was also an avid golfer, often playing at the Siwanoy Country Club course near his home. He is one of a very select few Club members who were granted honorary lifetime membership at Siwanoy. Rickenbacker became well known as a race car driver, competing in the Indianapolis 500 four times before World War I, and earning the nickname "Fast Eddie". 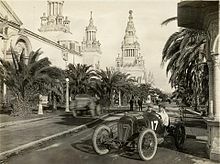 Rickenbacker joined the Maxwell Race Team in 1915 after leaving Peugeot. After the Maxwell team disbanded that same year, he joined the Prest-O-Lite team as manager and continued to race improved Maxwells for Prest-O-Lite. Rickenbacker wanted to join the Allied troops in World War I, but the U.S. had not yet entered the war. He had several chance encounters with aviators, including a fortuitous incident in which he repaired a stranded aircraft for Townsend F. Dodd, a man who later became General John J. Pershing's aviation officer and an important contact in Rickenbacker's attempt to join air combat. During World War I, with its anti-German atmosphere, he — like many other German Americans — changed his surname; the "h" in "Rickenbacher" became a "k" in an effort to "take the Hun out of his name." As he was already well known at the time, the change received wide publicity. "From then on", as he wrote in his autobiography, "most Rickenbachers were practically forced to spell their name in the way I had..."
On May 30, he scored his sixth victory. It would be his last for three and a half months. He developed an ear infection in July which almost ended his flying career and grounded him for several weeks. He shot down Germany's new fighter, the Fokker D.VII, on September 14, and another the next day. On September 24, 1918, now a captain, he was named commander of the squadron, and on the following day, he claimed two more German planes, for which he was belatedly awarded the Medal of Honor in 1931 by President Herbert Hoover. After claiming yet another Fokker D.VII on September 27, he became a balloon buster by downing observation balloons on September 28, October 1, October 3, October 27, and October 30, 1918. Thirteen more wins followed in October bringing his total to thirteen Fokker D.VIIs, four other German fighters, five highly defended observation balloons, and only four of the easier two-seated reconnaissance planes. 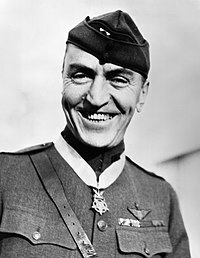 When Rickenbacker learned of the Armistice, he flew an airplane above the western front to observe the ceasefire and the displays of joy and comradeship, as the formerly warring troops crossed the front lines and joined in the celebrations. Rickenbacker was awarded the Distinguished Service Cross a record eight times. One of these awards was converted in 1930 to the Medal of Honor. He was also awarded the Legion of Honor and the Croix de Guerre by France. SPAD XIII in the colors of the 94th Aero Squadron. Aircraft is marked as Eddie Rickenbacker's aircraft. After World War I ended, Rickenbacker was approached several times about exploiting his fame. He chose to go on a Liberty bond tour. After the tour he was released from the army with the rank of Major. He felt he had earned the rank of captain and used that one the rest of his life. He was offered many movie positions, but did not want all the attention, even though he was the most celebrated aviator in America (soon to be supplanted by Charles Lindbergh after his solo flight across the Atlantic). Rickenbacker described his World War I flying experiences in his memoirs, Fighting the Flying Circus, published after the war. In this book, he also describes the character, exploits, and death of fellow pilot Lt. Quentin Roosevelt, the son of U.S. President Theodore Roosevelt. Rickenbacker also continued to associate with Reed Chambers, with whom he had served in World War I; they jointly founded an airline. 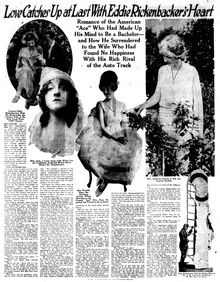 3 September 1922 Washington Times Full-page newspaper article about Rickenbacker and his wife (shown together at the left, his wife alone in her garden on the right). Rickenbacker was adamantly opposed to President Franklin Roosevelt's New Deal policies, seeing them as little better than socialism. For this, he drew criticism and ire from the press and the Roosevelt administration, which ordered NBC Radio not to allow him to broadcast opinions critical of Roosevelt's policies after Rickenbacker had harshly denounced the president's decision to rescind existing mail contracts in 1934 and have U.S. Army Air Corps pilots carry the air mail. At the time, Rickenbacker was vice president of one of the companies affected, Eastern Air Transport. When a number of inexperienced, undertrained Army pilots were killed in crashes soon afterward, Rickenbacker stated, "That's legalized murder!" Rickenbacker oversaw many radical changes in the field of commercial aviation. He negotiated with the U.S. government to acquire air mail routes, a great advantage to companies in need of business. He helped develop and support new aircraft designs. Rickenbacker bought the new, large, faster airliners for Eastern Air Lines, including the four-engined Lockheed Constellation and Douglas DC-4. Rickenbacker personally collaborated with many of the pioneers of aviation, including Donald W. Douglas, the founder of the Douglas Aircraft Company, and the designer and builder of the large, four-engined airliners, the DC-4, DC-6, DC-7, and DC-8 (its first jet airliner). Rickenbacker often traveled for business on Eastern Air Lines flights. On February 26, 1941, he was a passenger on a Douglas DC-3 airliner that crashed just outside Atlanta, Georgia. Rickenbacker suffered grave injuries, being soaked in fuel, immobile, and trapped in the wreckage. 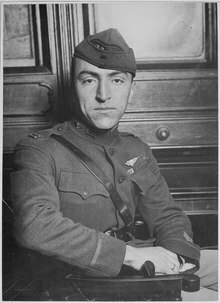 In spite of his own critical wounds, Rickenbacker encouraged the other passengers, offered what consolation he could to those around him who were injured or dying, and guided the survivors who were still ambulatory to attempt to find help. The survivors were rescued after spending the night at the crash site. Rickenbacker barely survived. This was just the first time that the press announced his death while he was still alive. It took many months in the hospital, followed by a long time at home, for Rickenbacker to heal from this multitude of injuries and to regain his full eyesight. Rickenbacker described his terrible experience with vivid accounts of his mental state as he approached death—emphasizing the supreme act of will that it took to stave off dying. Rickenbacker's autobiography reports that he spent ten days at the door of death, which he illustrated as "having an overwhelming sensation of calm and pleasure". Rickenbacker also scripted a popular comic strip called Ace Drummond from 1935–1940. He worked with aviation artist and author Clayton Knight, who illustrated the series. The strip followed the adventures of aviator Drummond. It was later adapted into a film serial and radio program. Between 1935 and 1940, Knight and Rickenbacker also did another King Features comic strip, The Hall of Fame of the Air, depicting airplanes and air battles in a fact-based series about famous and little-known aviators. This strip was adapted into a Big Little Book, Hall of Fame of the Air (Whitman Publishing, 1936). Rickenbacker supported the war effort as a civilian. While initially supporting the isolationist movement, Rickenbacker officially left the America First organization in 1940 after having only been a nominal member of the organization and only being a part of it at all for a matter of months. From this point on he took an outspokenly pro-British stance. He was inspired by "England's heroic resistance to relentless attacks" and in 1940 he wrote "Should these gallant British withstand the terrific onslaught of the totalitarian states until the summer of 1941, it is my sincere conviction that by that time this nation will have declared war." Rickenbacker was one of a few celebrities who took part in campaigns to rally his fellow World War I veterans to the British cause in the months before Pearl Harbor. In 1942, he toured training bases in the southwestern United States and in England. He encouraged the American public to contribute time and resources, and pledged Eastern Air Lines equipment and personnel for use in military activities. Under Rickenbacker's direction Eastern Air Lines, along with other air lines such as Pan American, provided the means of war to British forces and flew munitions and supplies across the Atlantic. Rickenbacker inspected troops, operations, and equipment, and served in a publicity function to increase support from civilians and soldiers. In 1942, with a sweeping letter of authorization from Henry L. Stimson, U.S. Secretary of War, Rickenbacker visited England on an official war mission and made ground-breaking recommendations for better war operations. He worked with both the British Royal Air Force and the American Air Force on bombing strategy including work with Air Chief Marshal Arthur Harris and General Carl Andrew Spaatz. One of Rickenbacker's most famous near-death experiences occurred in October 1942. Stimson sent him on a tour of air bases in the Pacific Theater of Operations to review both living conditions and operations, but also to deliver personally a secret message of rebuke to General Douglas MacArthur from the President for negative public comments MacArthur had made about the administration and disparaging cables sent to Marshall. After visiting several air and sea bases in Hawaii, Rickenbacker was provided an older B-17D Flying Fortress (AAF Ser. No. 40-3089) as transportation to the South Pacific. The bomber, (with a crew of eight) strayed hundreds of miles off course while on its way to a refueling stop on Canton Island and was forced to ditch in a remote and little-traveled part of the Central Pacific Ocean. The failure in navigation has been ascribed to an out-of-adjustment celestial navigation instrument, a bubble octant, that gave a systematic bias to all of its readings. That octant reportedly had suffered a severe shock in a pre-takeoff mishap. The pre-takeoff mishap occurred during the first attempt to take off in a different bomber, but the landing gear's brakes seized mid-takeoff. They kept the same damaged bubble octant on a different plane, which caused the navigational failure. This unnecessary ditching spurred on the development of improved navigational instruments and also better survival gear for the air crewmen. The B-17's aircraft commander, former American Airlines pilot Captain William T. Cherry, Jr., was forced to ditch close to Japanese-held islands but the Americans were never spotted by Japanese patrol planes, and were adrift on the ocean for thousands of miles. For 24 days, Rickenbacker, Army Captain Hans C. Adamson, his friend and business partner, and the rest of the 8 crewmen drifted in life rafts at sea. Rickenbacker was still suffering somewhat from his earlier airplane crash, and Capt. Adamson sustained serious injuries during the ditching. The other crewmen who were in the B-17, named Bartek, Reynolds, Whittaker, Cherry, Kaczmarczyk, and De Angelis, were hurt to varying degrees. The crewmen's food supply ran out after three days. Then, on the eighth day, a seagull landed on Rickenbacker's head. He warily and cautiously captured it, and then the survivors meticulously divided it into equal parts and used part of it for fishing bait. They lived on sporadic rain water that fell and similar food "miracles", like fingerlings that they caught with their bare hands. Rickenbacker assumed leadership, encouraging and browbeating the others to keep their spirits up. One crewman, Alexander Kaczmarczyk, was suffering from dehydration. He drank sea water, knowing it was a bad idea. He died and was buried at sea. The U.S. Army Air Forces and the U.S. Navy's patrol planes planned to abandon the search for the lost B-17 crewmen after just over two weeks, but Rickenbacker's wife persuaded them to extend it another week. The services agreed to do so. Once again, the newspapers and radio broadcasts reported that Rickenbacker was dead. The seven split up. Cherry rowed off in the small raft and was rescued on day 23. Reynolds, De Angelis, and Whittwaker found a small island, close to another, inhabited one. The natives of the second one were hosting an allied radio station, so all was good for the men. Reynolds was extremely close to death. A U.S. Navy patrol OS2U-3 Kingfisher float-plane spotted and rescued the 3 survivors on November 13, off the coast of Nukufetau in Tuvalu. All were suffering from hyperthermia, sunburn, dehydration, and near-starvation. Rickenbacker completed his assignment and delivered his message, which has never been made public, to General MacArthur. Rickenbacker had thought that he had been lost for 21 days and wrote a book about this experience titled Seven Came Through, published by Doubleday, Doran. It was not until later that he recalculated the number of days, and he corrected himself in his autobiography in 1967. The pilot of the plane that rescued the survivors, Lieutenant William F. Eadie, USN, was awarded the Navy's Air Medal for his actions during the rescue. The story was also recounted in Lt. James Whittaker's book We Thought We Heard the Angels Sing, published in 1943. The story of Rickenbacker's ordeal has been used as an example for Alcoholics Anonymous when the first of their Twelve Traditions was formulated: "Our common welfare should come first. Personal recovery depends upon AA unity." Still determined to support the U.S. war effort, Rickenbacker suggested a fact-finding mission in the Soviet Union to provide the Soviets with needed technical assistance for their American aircraft. Rickenbacker approached Soviet diplomats, and avoided requesting help from President Franklin Roosevelt, due to their prior disagreements. He scheduled resumption of his tour of American air operations in the Far East, interrupted by his ordeal in 1942, while he awaited approval of his visit from the Soviets. With Stimson's help and by trading favors with the Soviet ambassador, Rickenbacker secured unlikely permission to travel to the Soviet Union. The War Department provided everything Rickenbacker needed, including a highly unusual letter stating that the bearer was authorized to "visit ... any ... areas he may deem necessary for such purposes as he will explain to you in person", signed by the Secretary of War. Rickenbacker's trip in the spring and summer of 1943 took him along the South Atlantic air route that Eastern Air Lines had helped pioneer in 1941, traveling to Cairo in an AAF C-54 provided him by Gen. Henry H. Arnold, commanding general of the United States Army Air Forces. He made observations about conditions at every stop and reviewed American operations with a critical eye, forwarding reports to authorities. From Cairo he traveled by C-87 to India to experience the Hump airlift into China, on which he reported unfavorably to Arnold after his return to the United States. Continuing over the Hump to China himself, Rickenbacker was impressed by the determination of the Chinese people but disgusted with the corruption of the Kuomintang government. Reaching Iran, he offered to bring along an American officer to the Soviet Union, although approval of the request delayed Rickenbacker's party several days. In the Soviet Union, Rickenbacker observed wartime conditions, the extraordinary dedication and patriotism of the populace, and the ruthless denial of food to those deemed unproductive to the war effort. He befriended many Soviet officials and shared his knowledge of the aircraft they had received from the United States. He was lavishly entertained and recalled attempts by NKVD agents and officials to get him intoxicated enough to disclose sensitive information. Rickenbacker's mission was successful. He discovered that a commander of Moscow's defense had stayed at Rickenbacker's home in 1937, and personal connections like this and the respect the Soviet military personnel had for him greatly aided his information-gathering. He learned about Soviet defense strategies and capabilities. In the distraction resulting from the outbreak of the Battle of Kursk, he saw a map of the front line showing the locations of all major Soviet military units, which he did his best to memorize. He also persuaded his hosts to give him an unprecedented tour of the Shturmovik aircraft factory. However, comments made by Rickenbacker during his trip alerted the Soviets to the existence of the secret B-29 Superfortress program. For his service in support of the war effort, Rickenbacker received the Medal for Merit, a decoration for civilians in service to the United States government equivalent to the military Legion of Merit. Although his main home was in New York City for many years, Rickenbacker owned a winter home in Coconut Grove, Florida, near Eastern Air Lines' major maintenance and administrative headquarters at Miami International Airport. For a time, Eastern was the most profitable airline in the postwar era. During the late 1950s, however, Eastern Air Lines' fortunes declined, and Rickenbacker was forced out of his position as CEO on October 1, 1959. Rickenbacker also resigned as the Chairman of the Board on December 31, 1963, at the age of 73. After that, Captain and Mrs. Rickenbacker traveled extensively for a number of years. In the 1960s, Rickenbacker became a well-known speaker. He shared his vision for the future of technology and commerce, exhorted Americans to respect the adversary, the Soviet Union during the Cold War, but still uphold American values. Rickenbacker endorsed many conservative ideas. From these principles and our labors together emerged one of our country's great airlines and further developed our great heritage of pioneering. In the years ahead young, strong hands will carry them into a future which you and I, with all our dreams, can scarcely visualize—that "Parade of Youth" which always was and always will be the true spirit of Eastern Air Lines. Captain Rickenbacker suffered from a stroke while he was in Switzerland seeking special medical treatment for Mrs. Rickenbacker, and he then contracted pneumonia. Rickenbacker died on July 23, 1973 in Zürich, Switzerland. A memorial service was held at the Key Biscayne Presbyterian Church with the eulogy given by Lt. General Jimmy Doolittle, and then his body was interred in Columbus, Ohio, at the Green Lawn Cemetery. At the time of his death, he was the last living Medal of Honor recipient of the Air Service, United States Army. In 1977, at the age of 92, Adelaide Rickenbacker was completely blind, suffering from failing health, and still grieving severely from the loss of her husband. She committed suicide by gunshot at their home on Key Biscayne, Florida. 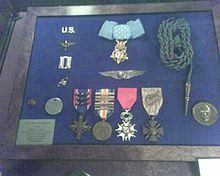 Note - Rickenbacker was originally awarded the Distinguished Service Cross a total of eight times. One of these awards, however, was upgraded in 1930 to the Medal of Honor. q.v. Rickenbacker was inducted into various halls of fame including the National Aviation Hall of Fame in 1965, the International Motorsports Hall of Fame in 1992, the National Sprint Car Hall of Fame in 1992, the Motorsports Hall of Fame of America in 1994, and the Georgia Aviation Hall of Fame in 1999. What is now Dobbins Air Reserve Base was originally called Rickenbacker Field in his honor when it opened in 1941. In 1945 20th Century Fox made a movie called Captain Eddie. It starred Fred MacMurray as Rickenbacker. In November 1947, a four-mile (6 km) causeway was completed, linking Miami on the mainland of Florida with Crandon Park on the island of Key Biscayne. The road was named Rickenbacker Causeway in his honor. In 1974, Lockbourne Air Force Base, a Strategic Air Command (SAC) installation in his home town of Columbus, was renamed Rickenbacker Air Force Base. On April 1, 1980 it was turned over to the Ohio Air National Guard and renamed Rickenbacker Air National Guard Base. It now shares the airfield with Rickenbacker International Airport. The Rickenbacker award is the Civil Air Patrol cadet achievement equivalent to an Air Force Technical Sergeant. Cadets awarded the Rickenbacker achievement are promoted to C/TSgt. The United States Postal Service issued a postage stamp in honor of Rickenbacker's accomplishments as an aviation pioneer in 1995. The postage stamp was reprinted in 1999 and reissued in 2000. The story of Eddie Rickenbacker "and his courageous company" appears on page 131 of the TWELVE STEPS AND TWELVE TRADITIONS of Alcoholics Anonymous. It pertains to when their plane crashed in the Pacific and is used in the closing remarks of Tradition One ("Our common welfare should come first; personal recovery depends upon A.A. unity."). Rickenbacker is featured as a character in the pilot episode of the science fiction series Voyagers! He was played by Peter Frechette. In The Twilight Zone episode "The Parallel", it is mentioned that, in the parallel universe, Rickenbacker was never found after the crash of Eastern Air Lines Flight 21 on February 26, 1941. ^ Rickenbacker 1967, p. 17. ^ "Siwanoy and Members Build Kerrigan a Super-Shop" (PDF). Golfdom. Retrieved May 3, 2015. ^ Zabecki, David (August–September 2009). "America's Top World War I Ace". Military History. p. 80. ISSN 0889-7328. Retrieved August 12, 2016. ^ "Eddie Rickenbacker in a Maxwell Special". Retrieved August 12, 2016. ^ Maurer, Maurer (1978). The U.S. Air Service in World War I, Volume II: Early Concepts of Military Aviation. Washington, D.C.: DIANE Publishing. pp. 75–88. ^ Rickenbacker 1967, p. 115. ^ Rickenbacker 1967, p. 66. ^ Farr, Finis. Rickenbacker's Luck – An American Life. Houghton Mifflin Company. pp. 36–37. ^ Frey, Royal D. (1968). "Air Service Relived". Air University Review. 22 (Nov–Dec). Retrieved August 12, 2016. Rickenbacker was not, as is often seen, an instructor at Issoudun. ^ "American decorations : a list of awards of the Congressional Medal of Honor, the Distinguished-Service Cross and the Distinguished-Service Medal awarded under authority of the Congress of the United States". p. 523. Retrieved August 12, 2016. ^ "American decorations : a list of awards of the Congressional Medal of Honor, the Distinguished-Service Cross and the Distinguished-Service Medal awarded under authority of the Congress of the United States". Retrieved August 12, 2016. ^ a b c d e f g h "Edward Rickenbacker". The Aerodrome. 2007–2009. Retrieved July 8, 2009. ^ American Aces of World War I. p. 69. ^ "Rickenbacker Club of America". Retrieved August 12, 2016. ^ Rickenbacker 1967, p. 154. ^ Dr. James P. Tate (June 1998). The Army and Its Air Corps / Army Policy toward Aviation / 1919–1941. Air University Press. p. 156. ^ Virginia Van Der Veer Hamilton (August 1974). "Barnstorming the US Mail". American Heritage magazine. Archived from the original on January 7, 2009. Retrieved April 27, 2009. ^ Rickenbacker 1967, p. 186. ^ Rickenbacker 1967, p. 144. ^ Rick A. Jorgensen. "The Strange Story of EDDIE RICKENBACKER, W.C. DURANT, & THE SHERIDAN". Golden Era Automobile Association (geaaonline.org). Retrieved May 31, 2009. ^ Rickenbacker 1967, p. 162. ^ Rickenbacker 1967, p. 178. ^ Daly Bednarek, Janet Rose; Launius, Roger D. (2003). Reconsidering a Century of Flight. UNC Press Books. p. 127. ISBN 9780807854884. Retrieved August 1, 2014. ^ Rickenbacker 1967, p. 394. ^ Rickenbacker 1967, p. 261. ^ a b Rickenbacker 1967, p. 241. ^ Rickenbacker 1967, p. 278. ^ Fleming, Thomas (Fall 2008). "Lost at Sea for 24 Days". American Heritage. American Heritage Publishing. Retrieved December 7, 2017. ^ Rickenbacker 1967, p. 317. ^ Alcoholics Anonymous (2002-02-10). Twelve Steps and Twelve Traditions. Hazelden. ISBN 0-916856-01-1. OCLC 13572433. ^ Rickenbacker 1967, p. 390. ^ Rickenbacker 1967, p. 376. ^ Boyne, Walter J. (2009). "Carbon Copy Bomber" (PDF). AIR FORCE Magazine. 92 (June): 53. Retrieved August 12, 2016. ^ Rickenbacker 1967, p. 425. ^ Rickenbacker 1967, p. 438. ^ Serling 1980, p. 455. ^ "Eddie Rickenbacker Returns to Columbus". Archived from the original on October 2, 2011. Retrieved June 11, 2011. 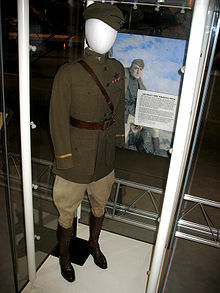 ^ "Eddie Rickenbacker". Claim to Fame: Medal of Honor recipients. Find a Grave. Retrieved December 23, 2007. .
^ "Adelaide Frost Rickenbacker". Auburn University. Retrieved June 8, 2015. ^ "US Army Distinguished Service Cross Recipients for World War I" (PDF). Military Awards for Valor-Top 3. US Department of Defense. Retrieved 12 November 2017. ^ "Medal of Honor recipients". Medal of Honor recipients: World War I. United States Army Center of Military History. June 8, 2009. Retrieved July 2, 2009. ^ "Edward V. Rickenbacker". Georgia Aviation Hall of Fame. Archived from the original on 2017-06-01. Retrieved October 9, 2018. ^ "Captain Eddie". imdb. Retrieved August 12, 2016. 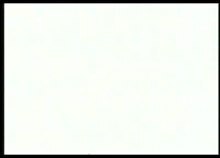 ^ Blank 1996. p. 160. ^ "The Earliest Days of the Electric Guitar". Rickenbacker Guitars. Wikimedia Commons has media related to Eddie Rickenbacker.